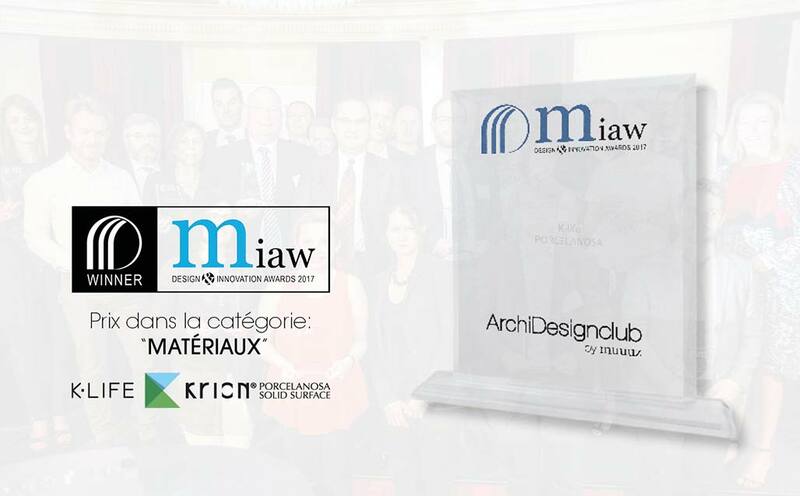 At the Grand Hotel InterContinental Opera de Paris on the 1st of June, the ceremony for the Muuuz International Awards (MIAW) was held, organised by ArchiDesignClub in association with the Muuuz D'A magazine. In its five editions it has awarded the most notable and innovative products in the world of architecture, design and decoration. On this occasion, the Solid Surface from PORCELANOSA Group, KRION® K-LIFE, won the award in the “Coverings” category. K-LIFE is manufactured with KRION ECO-ACTIVE SOLID TECHNOLOGY (KEAST), giving our material new properties which distinguish us from everything known to date in the world of Solid Surface. In addition to the properties of KRION®, the new characteristics offered by KEAST are air purification, an anti-bacterial effect, the elimination of chemical products, and easy cleaning. On behalf of PORCELANOSA Group, the ceremony was attended by Marie-Line Dechelette, head of marketing at Porcelanosa France, and Santiago Pérez, KRION® commercial manager in France.